In the last few months, I've introduced the concept of undulating Periodization as it applies to bodybuilding programs. This month is the final stage of the program. In the last few months, I&apos;ve introduced the concept of undulating Periodization as it applies to bodybuilding programs. This month is the final stage of the program. Phase one is approximately three to six weeks with four workouts per week, stage two is eight weeks with three workouts per week and this final stage is again, three to six weeks, and back to three sessions per week. I also used an alternating sequence where we started with a rep range, went lower for a phase, and come back slightly higher for this phase. Altogether you should have the makings of a fourteen to twenty week, results-by-design, not by coincidence training program. Recent published research from Arizona State University has shown that a method of structuring the set and rep protocols in a vastly different manner (called undulating Periodization) has proven to be especially effective in inducing maximum strength gains, when compared to traditional linear or alternating Periodization models. Traditional thinking states that the body adapts to a workout in as little as 6 exposures. In actuality - the body adapts to the rep range the fastest, and the exercise selection the slowest. 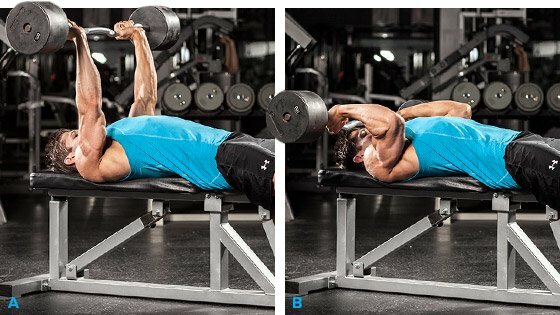 So we need to change the rep bracket more often than we change the exercises. Typically a trainee will change the exercises first - not the most effective training system. The undulating Periodization program actually adjusts the sets, reps, speed of movement (tempo), and rest period every single workout. So in effect, your body has to grow bigger and stronger than it normally would when using one of the more traditional Periodization models. During this phase, each body part will get worked twice per week. However, due to the unique loading parameters, you will actually train each bodypart three times before ever repeating a workout. The fun part is the variety of doing so many different routines. The exciting part is that as you only repeat each workout every 10 days or so, you can stay with this program for longer, and make better and faster gains than you typically would. It&apos;s time for another three week phase. Prior to beginning this phase though, all of you should have completed parts one and two for best results. Before beginning this phase though - I want you to take a full recovery week - a week completely away from the gym. Don&apos;t worry you won&apos;t shrink - you might even grow. During phase three we move back to a two way, upper and lower split, with abs trained every workout. The set and rep range again changes, just be sure to follow the routine in the order they are written. Tempo refers to lifting speed. The first number is lowering, the second is pausing in the bottom position, and the third is lifting. So a 422 tempo would be a 4 second lowering, a 2 second pause and a 2 second lift. If the letter X appears - it refers to eXplosive - go as fast as possible. "The undulating Periodization program adjusts the sets, reps, speed of movement (tempo), and rest period every single workout." Over the last few months I&apos;ve introduced you to the science of advanced programming. Anyone is capable of designing a workout. For best results, that workout has to be part of a mesocycle or short term program, which in turn has to be part of a macrocycle or long term program. The undulating Periodization models are unique in that they "violate" the traditional models for designing programs. It&apos;s almost a non-program when you look at it, but when you try it and see the superior gains it offers, you&apos;ll soon start thinking outside of the box, and begin looking for more alternative programs. Not everyone has an hour to work out. HIIT your muscles hard with these short, intense workouts designed to burn maximum calories in minimum time! Get That Leg Up: The Leg Blaster You Must Start Doing! When it comes to squats, deeper is always better. Add rear-leg elevated split squats into your regimen and see how low you can go! For the past sixteen years, Alwyn Cosgrove has been committed to achieving excellence in the field of fitness training and athletic preparation.